Looking for that special baptism gift for your daughter, Goddaughter, niece, granddaughter, cousin? Here it is...a personalized Baptism Poetry Gift asking God to bless the baby girl and always keep her in His care. 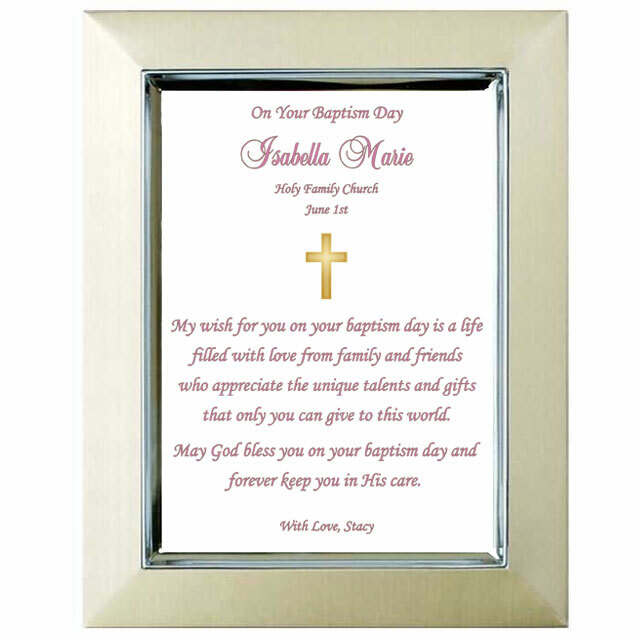 This meaningful gift presented in a striking brushed gold and silver 5x7 inch frame can be personalized with names, Baptism date, church name, and a personal message from you. When you or the parents add a photo of the child on her Baptism day this photo frame becomes a cherished Baptism keepsake. You waited for her to be born and now she is being baptized. Capture the spirit and importance of this day with an EXCLUSIVE baptism keepsake for baby and family to treasure. 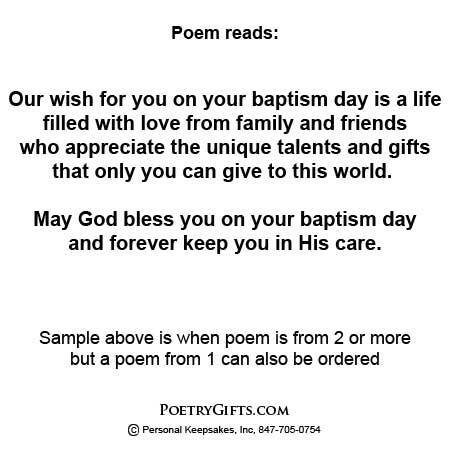 This personalized Baptism Poetry Gift was created for that purpose. The touching poem for a baby girl is printed in a rosey pink color. Outside frame dimensions measure 7" x 9". The cut-out photo area measures 3" x 4". (see Details tab for more information) Suitable for displaying on a shelf or table or the picture frame can be hung on a wall. A truly unique Baptism keepsake for your daughter, granddaughter, niece, cousin or Goddaughter! 5. Closing Phrase and Your Name(s) (as seen after poem) - (Examples: Love Always, Mommy & Daddy; With Love, Aunt Susan & Uncle Jake; etc.)" The photo opening is approximately 3" x 4". You can display the most important part of a larager photo. If you do not want a photo area in your Poetry Gift, choose the No Photo Area option when placing your order.